There has been a rapid improvement in smart home technology in recent years, giving many homeowners unparalleled control over the security, access and comfort of their homes. But what are the options for making your home smart? Here we look at five smart home technologies that can put you on the path to a modern smart home. Throw away your keys because you won’t be needing them anymore. With a smart lock, the locks on your home can be controlled via your smartphone and advanced models can even respond to a Bluetooth signal from your phone to automatically unlock the door as you approach. Most models allow you to unlock or lock your home from anywhere, giving you the option to let friends and family into your home without being present. Some models also include keypad entry and the option to set different codes for different people, allowing you to monitor and control access – particularly useful if you happen to run a business from home. Some of the biggest advantages include never needing (or losing!) keys again, never having to worry whether you remembered to lock the door, and the ability to control and know exactly who has accessed your home and when. For peace of mind, convenience and security, this is one of the best smart home updates around. Want to know who is at your door at any time of the day? That’s where a video doorbell comes in. Replacing a traditional doorbell, a video doorbell generally connects to your mobile phone via WiFi allowing you to see who or what is at your doorstep and even communicate with them. A variety of models exist but many can be set up to alert you the moment someone or something approaches and some can even tell you whether the person arriving is a friend or a stranger. Combined with a smart lock, this could create the ultimate home entrance package. You’ll know exactly who you are opening the door for and have clear records of exactly who arrived and when – which will certainly help with delivery companies. A smart thermostat takes the frustration out of programming your home heating and cooling, offering a significant improvement on the older model “programmable” thermostats. The best models will monitor your usage, daily patterns and schedules, and preferred temperatures, then use that information to optimise the use of heat in your home and save you money. 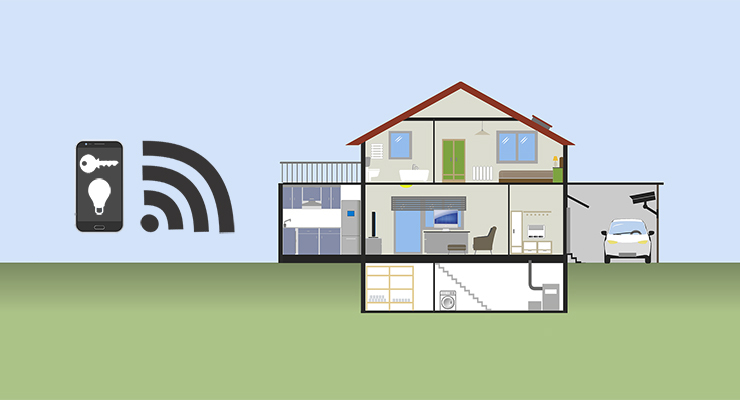 You can control them from afar to start heating your home before you arrive and can even connect them to other smart home technology to improve it’s learning capabilities. For example, by connecting it to a smart lock, it can detect who is in the house and set the temperature to meet their preferences. Quite simply, it will save you money. By optmising your home temperature for when you are in and out of the house, you will no longer waste money on unnecessary heat or air conditioning. Turn all your lights on or off with a tap on your smartphone. Program the lights to come on at a specific time, whether to give the appearance that someone is at home, to help wake you up, or for some other reason. Program different options to change the mood and feel of your house with ease. In short, gain full control of the look and feel of your home. No more walking around your home turning off lights. No more worrying that your house looks empty when you’re away for a while. And no more worrying that you left the lights on! We’re not going to get into a debate about which is better but smart assistants like Amazon Echo and Google Home can be an invaluable centerpiece to a smart home system. The voice-activated home assistants are now familiar to many and can play music, answer questions, make lists and much more when asked to. Perhaps best of all for a smart home, they can connect to other smart technologies to allow them to be controlled, by voice, from one central unit. Although many manufacturers allow you to connect their smart products, a smart assistant allows you to bring together all your smart technology regardless of the manufacturer. That alone will make it worthwhile to many but the additional features of the assistant systems also add to the list of benefits.